The 52 week money challenge has become a popular method for saving money over the past couple of years, but it’s not the only way to increase one’s savings. For some people, the weekly method simply doesn’t meet their savings style. They need to concentrate on savings small amounts on a daily basis. Last year I had someone come to me with exactly that issue. She had attempted the 52 week money challenge, but failed and wanted to know if there was a challenge she could try that would help her get into a savings habit by doing it daily. 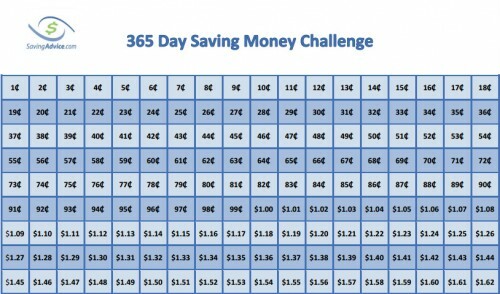 For those who need to begin the savings game, but aren’t confident they can do so because of past failures, the 365 day money challenge is the perfect place to begin. This is because it requires the participant to save a small amount of money each day, but the amounts are so small that even a child could do it. Since it is being done on a daily basis, there’s a much better chance the savings becomes a habit. The 365 day money challenge concept is simple. A year consists of 365 days, so in the challenge, every day before you start your day, you are required to pay yourself. This is mandatory. Of all the things you pay on a daily basis, learning to pay yourself something is vitally important. For those who aren’t used to putting aside money for their future, the best way to instill this habit to to begin with small amounts. Conventional wisdom says it takes 3 weeks of doing something daily to form a habit, so making saving as easy as possible makes sense for the first 21 days to ensure success. In fact, it doesn’t hurt to spend more time in this habit-forming stage to make sure the habit truly takes hold. (click on image to enlarge and print)Each morning when you start your day, you’ll pay yourself an amount of your choosing before you do any other activity. You can set the payment amount anywhere between one cent and $3.65. After you make the payment to yourself, you cross out the corresponding box on a 365 day money challenge sheet. The next morning, your payment can match any of the remaining amounts on your chart. You keep doing this day after day, each morning for a whole year. 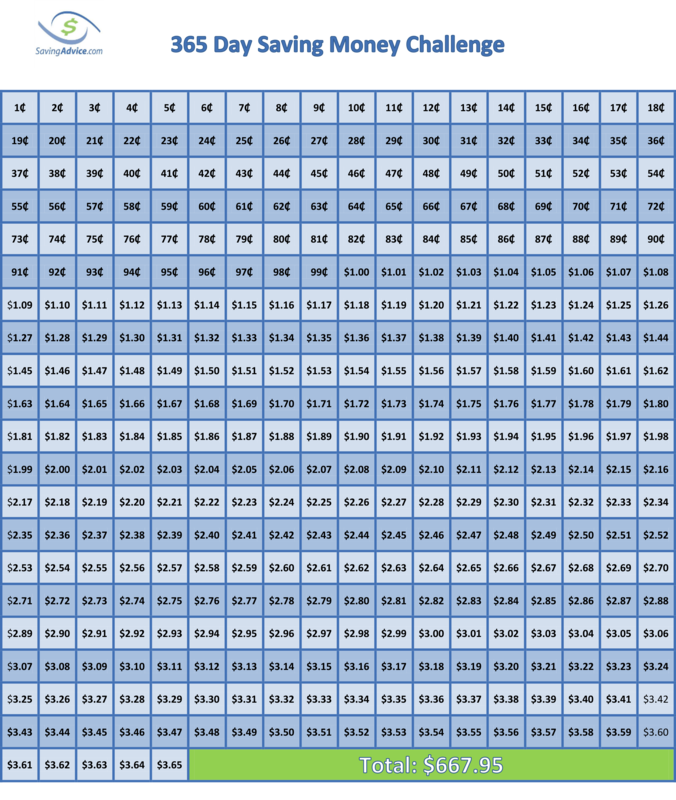 By the time you are done with the chart, you will have an extra $667.95 in savings. What’s more, you’ll have the financial habit of paying yourself to create savings, which will greatly reward and benefit you for the rest of your life. There are two essential steps which will help you do the challenge. The first step is to print your challenge sheet, and place it somewhere where you will see it every single morning. You want to place it somewhere where it’s impossible to avoid. A good example would be to place it on the mirror in your bathroom. This way, it’ll be the first thing you see in the morning, before you even brush your teeth. Another good place would be right next to your coffee maker if you have a cup of coffee every morning. It should be in your sight at the beginning of each day so there’s no way to “accidentally” forget about the challenge. The second step is to add a concrete action of actually paying yourself every morning. You need to do more than think, “Oh, I have that money so I’ll transfer it into my bank account the the end of the week.” You should physically go into your wallet or purse and place that day’s payment to yourself into a jar, or some other type of container specifically chosen just for this challenge. This container should be in the same spot where you have your challenge sheet so you’ll see it every morning when you get up. You’re making a payment to yourself, and it’s just as important as any payment you’d make to a store, bill or service provider. The truth is, it’s even more important, and it’s definitely the most crucial payment you’re going to make each day. Why? Because it’s a payment devoted to establishing your financial future. For people who have had a hard time getting their finances together, the 365 day money challenge has advantages over the 52 week money challenge in two significant ways. The first is that anyone, no matter what their financial situation may be, can jump right in because anyone can afford to participate no matter what their current financial situation. If you can only afford to pay the absolute lowest amounts for the whole first month, you will have only have to find $4.65 after 30 days. It does not take a huge amount of money to receive the benefits the 365 day money challenge has to offer. The second advantage is the 365 day money challenge is done each day instead of weekly. This requires you to think about saving money every day. By thinking about and taking a savings action daily, you are in a much better position to make saving money into a habit. Even if what you save each day isn’t a large amount, you benefit from thinking about it and taking an action on it. By the time 2016 arrives (although it’s okay to begin the challenge at any time), you will be naturally conditioned to paying yourself first, and saving money will have become a part of your daily routine. On the other hand, only thinking about saving your money once a week makes it more difficult to form the savings habit. Since it takes 21 days of action to form the habit, instead of having that foundation after the first month, the 52 week money challenge will take about 5 months for the habit to form since the action is only being done once a week. If you tried the 52 week money challenge in years past, and you were unable to finish it for whatever reason, give the 365 day money challenge a serious try. The same goes for any friends you have you have tried and failed. A $668 emergency fund is a great place to start when building your savings, but even more importantly, you’ll be in a position to save a lot more money in the years to come. In recent years there has been an explosion in smartphone apps designed to help people save money and keep better track of their finances. One great savings app is digit.co. What digit does is take a look at your savings account balances and then makes small withdrawals to deposit into savings. It is easy to install and makes saving virtually effortless. Check it out at digit.co.